In the real world, if coloured gems the size of oranges started raining into your lap you'd rush to scoop up as many as you could whilst also, probably, trying to shield your head from serious injury. Not so in the gaming world however, where the instinctive thing to do is match three of the same coloured gems into a line for points. 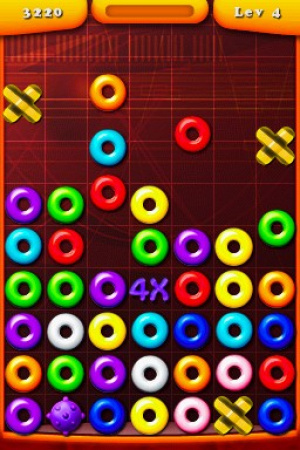 Teyon knows this, and wants to help hone those matching skills with its upcoming DSiWare puzzler Super Swap. With several variations on the standard match-three gameplay included for 500 Points this could be a decent puzzler to pass the time with. Check out the trailer and screenshots below, and expect a full review shortly after the game's North American release date of June 21st. EPIC WHITESPACE. Unless there's supposed to be a Youtube vid there and my Flash player has failed. I want to eat those gems. Is it even worth posting about a new DSiWare puzzle game? I'll be optimistic about this, but I probably won't get it. @Raylax - Video was down for a while, it's back now.